The Masculine Heart: Richard Sherman Responds to Being Called a “Thug” - The Man Behind the "Rant"
Richard Sherman Responds to Being Called a “Thug” - The Man Behind the "Rant"
I did not and do not believe Richard Sherman is a thug. He is a Stanford graduate, a young man who had straight A's in high school while insisting on taking advance placement classes, and after coming into Stanford as a wide receiver (one of the "glamor" positions in football, he ASKED to switch to defensive back. I did know much about the man (such as the info above) aside from his age (24) and his position as one of the best corner backs in the game, and also one of the best trash talkers in the game. I figured that his comments to Erin Andrews after the game were partly his youth, and mostly that he had just helped his team reach the Super Bowl with an outstanding defensive play against one of the best wide receivers in football. 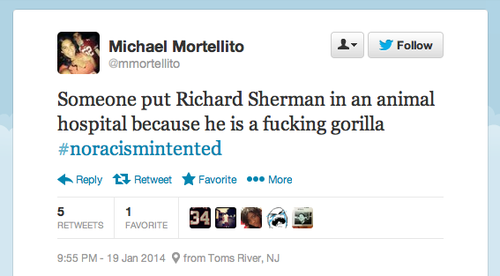 But then the backlash started - almost immediately - so I began to look for more info about Sherman. 4. 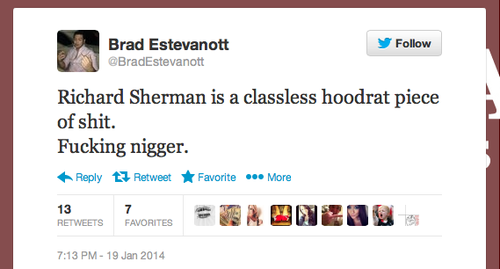 Sherman graduated second in his class in high school and also graduated from Stanford. So not only is he not a fool, odds are he’s smarter than you and me. 5. His degree from Stanford was in communications … which might explain why, while he seemed to be hollering like a crazy person, he didn’t curse and looked into the camera the whole time. 6. In other words, he might have just been auditioning for the WWE. 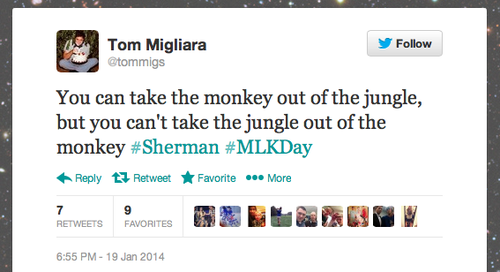 Wednesday night, NFL Films showed a much different Sherman, who was mic'd up during the game. With seconds left in the fourth quarter, he made the game-saving tip in the end zone on a ball intended for Crabtree that was intercepted by Malcolm Smith. 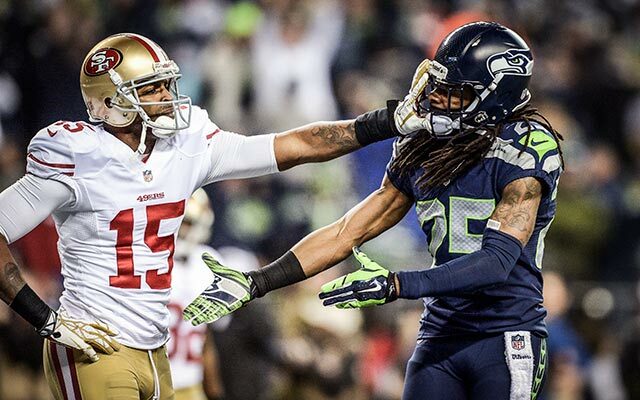 Moments later, Sherman found Crabtree and said, "Hell of a game. Hell of a game," while extending his hand. "I ran over to Crabtree to shake his hand but he ignored me. I patted him, stuck out my hand and said, 'Good game, good game.' That's when he shoved my face, and that's when I went off," Sherman said. Finally, Sociological Images takes a rather disturbing look at the Twitter storm or racist bigotry that erupted within moments of Sherman's interview. Sherman’s making two points. First, that there was nothing thug-like about his behavior. Thugs are violent criminals. He’s just playing a game. And, second, the term is decidedly racial, applied to him largely because of the color of his skin. Meanwhile, hockey players, who are overwhelmingly white, as well as other white athletes, don’t as often get these sorts of labels even if they are physically violent in ways that exceed the demands of their sport.